Eye Laser Consulting and Robert M. Kershner, MD, MS, FACS offer the complete spectrum of consulting services within the medical field of ophthalmology. If you are looking for information or wish to obtain an indepth consultation on any aspect of medical, surgical, instrumentation, educational opportunities, research, or up-to-the -minute information technology, please feel free to contact us by phone or e-mail. If you are interested in the latest technologies for vision correction, welcome to the latest, exciting new alternative to glasses and contacts. Lasik brings together the science of the Excimer Laser and the skill of the surgeon to correct nearsightedness, farsightedness and astigmatism. A brief, outpatient procedure that could significantly lessen your dependence on corrective lenses. The name "Lasik" is short for "laser in-situ keratomileusis." Like Photorefractive Keratectomy, and other procedures which utilize the Excimer laser, Lasik reshapes the cornea with laser technology. The shape of the cornea is what determines whether you are nearsighted, farsighted, have astigmatism, or have normal vision. With the Lasik procedure, Dr. Kershner first lifts a thin layer of the cornea to create a "flap" that stays connected on one side. The eye works by refracting light onto the retina. As light enters the eye, it first passes through the cornea before continuing through the pupil and lens, and finally, the retina. 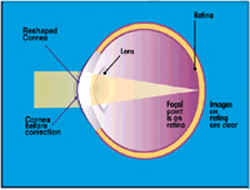 If the curvature of the cornea is steeper than normal, light is improperly focused on the retina. This results in Myopia, or nearsightedness. If the cornea is flatter than normal, the result is hyperopia or farsightedness. Myopia (nearsightedness) occurs when the eye is too long for the focusing system, and rays of light are focused in front of the retina. Farsightedness occurs when the eye is too short. Glasses or contact lenses refocus light onto the retina. The Excimer Laser developed in the U.S., has been used to correct nearsightedness, farsightedness and astigmatism for years. 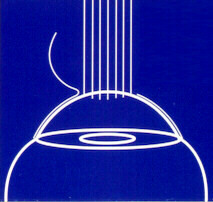 in 1995, it was approved for use in the United States. The Excimer Laser emits a "cool" laser light that can remove microscopic amounts of tissue with extreme precision. 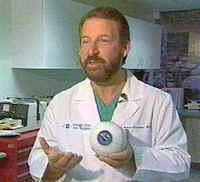 Dr. Kershner can program the laser to sculpt the cornea and reshape the eye. Typically less than one quarter of the diameter of the a human hair is actually removed and the procedure itself is completed in less than a minute. 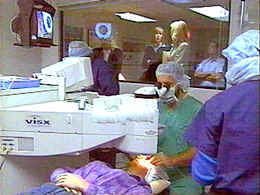 The Excimer Laser sculpts the cornea with a cool, ultraviolet light. To determine whether Lasik is right for you, you should undergo an evaluation with your eye care professional. There, we can confirm that your degree of myopia, hyperopia or astigmatism is within the proper range, make sure that you are free of any eye disease, and discuss the details of the Lasik procedure. You should bring your glasses or contacts with you. We require that patients be at least 18 years of age, have a prescription for corrective lenses that have remained stable for at least one year, and be in good general health. Finally, Doctor Kershner returns the "flap" to its original position for a quick, natural recovery. Throughout the Lasik procedure, you are awake. Doctor Kershner gives you some eye drops to numb your eye so that throughout the entire procedure, you are comfortable. 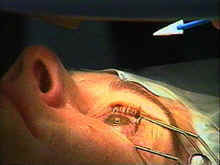 Typically, the procedure takes less than ten minutes for both eyes. 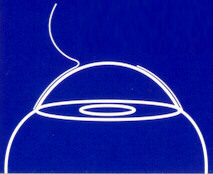 A human hair etched with the accuracy of the laser. Next, using an automated instrument called a microkeratome, Dr. Kershner lifts a thin layer of the cornea. 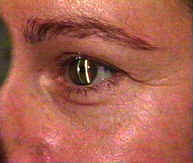 This "flap" remains attached on one side, as the Excimer Laser reshapes the newly exposed layer of the cornea. Once this surface of the cornea has been reduced by the exact amount necessary, which often takes less than a minute, Doctor Kershner returns the "flap" to its original position. The shape of the cornea is corrected and protected under the surface of the flap which speeds up healing and avoids discomfort. After the procedure, you will leave with an eye shield and eye drops to help your eyes heal. Your vision may be a little blurry for the first day. Most patients are able to return to work within 48 hours, and have continuing improvement in their vision over the first several weeks. Many people experience a newfound freedom from glasses and contact lenses. Others, including those over forty, experience less dependency on corrective lenses but may still require glasses for reading. Of course, as with any surgery, there are risks. And we want you to be completely informed. The risks of LASIK will be explained in detail to you at your initial consultation. We will provide you with a written informed consent document for you to take with you so that you fully understand the procedure and its risks. If you would like to further explore consumer information on LASIK, click here to view the FDA's Consumer Guide to LASIK. The statistical likelihood is that you too can enjoy clear vision without glasses-but we want you to be fully informed. Over three and one-half-million people have benefited from this amazing technology in the U.S. alone! You can too! We are committed to helping you decide whether Lasik is right for you. Dr. Kershner is available and always willing to answer your questions as you consider the procedure. Hopefully, as we discuss the risks and rewards, we'll make a believer out of you too. Join the thousands we have helped to achieve visual freedom and improve your sight at the speed of light! And, less dependent on eyeglasses and contact lenses. Change the way you SEE...and change your LIFE! Robert M. Kershner, MD, FACS is one of the world's most experienced refractive eye specialists having helped thousands of your friends and neighbors to see more clearly. 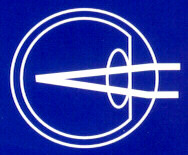 Eye Laser Consulting, Boston, Massachusetts, USA Call or Contact us by e-mail NOW! *Individual results may vary. Persons over the age of forty are more likely to require glasses for reading. Sunglasses may be necessary when out of doors. As with all surgical procedures, there is no assurance or guarantee as to the outcome of the procedure. This website is intended for educational purposes only. It is not a substitute for medical advice from a physician. Use of this site constitutes an agreement with the user that releases the Eye Laser Center, Eye Laser Consulting and Robert M. Kershner, MD, MS, FACS from any and all liability. Robert M. Kershner, M.D., M.S., F.A.C.S. SET YOUR SIGHT ON US...AND SET YOURSELF FREE!